When you or a family member have suffered an injury that requires legal action, you don’t have the time not to have an attorney that has your best interest at heart—and most importantly, will deliver the best possible outcome. The team of highly experienced attorneys at Charles J. Argento & Associates have dealt with all matters of personal injury and accidents for client upon and client, and know exactly how to get you the compensation that you deserve. At the helm of the firm, with nearly three decades of experience in the field, is Charles J. Argento, who’s known for providing aggressive, cost-efficient and responsive representation. “I’ve always been interested in trying to help people. I wanted to learn what it took for insurance companies to pay top money on cases,” says Mr. Argento, of how he came to be one of Houston’s most sought-after personal injury attorneys. After graduating from State University of New York at Buffalo, he earned his juris doctorate from South Texas College of Law. 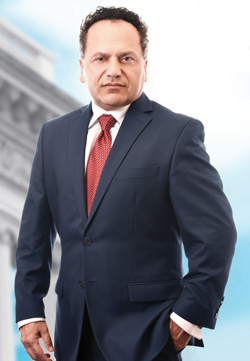 At Charles J. Argento & Associates, Mr. Argento serves as lead counsel, and together with his staff of highly trained and efficient, bilingual paralegals, secretaries and clerks, works on cases involving car and truck accidents, defective products, medical device lawsuits, bad drugs, wrongful death and more. Their goal as a firm is to provide each and every client with the highest quality of legal services available. Throughout his career, Mr. Argento has continually received recognition for his excellence by his clients, colleagues and the press. He holds two of the most prestigious ratings: “AV” by the Martindale-Hubbell Law Directory—the highest rating worldwide for legal ability and ethical standard, awarded to less than 5 percent of attorneys in the U.S.—for the past 20 consecutive years, and 10/10 by Avvo, reflecting his superb professional conduct and experience in the legal community, and providing an unmatched level of transparency, information and guidance. On top of those honors, Mr. Argento was distinguished as the “National Top 100 Trial Attorneys” in the country; the “10 Best” in client satisfaction by the American Institute of Personal Injury attorneys; the “Top 3 Personal Injury Lawyers in Houston” by Three Best Rated; and “Houstonia Top Lawyers in Houston.” He also holds a Distinguished Justice Advocates certificate, awarded to only the top 1 percent of attorneys in America. “Helping people that have been taken advantage of from insurance companies and big corporations is, without a doubt, the part of my job I love,” says Mr. Argento.